The thought of enrolling in the Police Academy may not be everyone’s cup of tea, but still, it MUST be exciting to be a detective or perhaps part of the CSI team! In the edge-of-your-seat hidden object game Masters of Mystery: Blood of Betrayal, you get to experience a day in the life of clever Sergeant Carrie Chase as she attempts to crack a double homicide. Granted, she has to put up with a rookie as a partner, but hey, things could be worse! 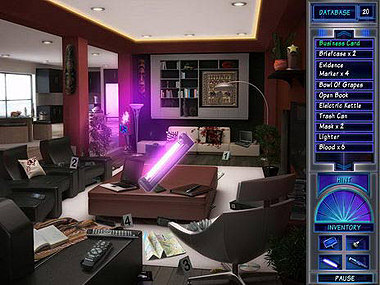 This exciting hidden object game starts with what appears to be a typical day for Sergeant Chase: It’s a crime scene of a double homicide at the penthouse of a fancy Manhattan building. However, nothing is as it seems and the plot thickens when Chase’s Captain is killed under suspicious circumstances. Dodgy evidence starts turning up all over town, which seems to point to a Colombian drug lord connection and even crooked cops. One thing leads to another and before you know it, Chase gets to trek all over Manhattan, based on the clues she finds at each previous scene. A flyer might lead her to a pretentious nightclub owner or a business card to a limousine service. The story of Masters of Mystery: Blood of Betrayal is told in-between scenes and mini-games and really walks you through the game bit-by-bit as more information unravels. 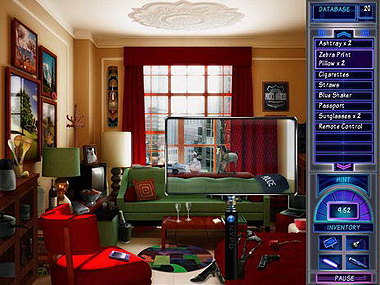 All the hidden object scenes have great visuals and thankfully lack the irrelevant random objects some creators like to throw in. All objects are in decent proportions and the right locations (no funny business like strawberries on the ceiling). Plus you get to collect some very valuable forensic tools, like a UV filter which you can use to find blood spatters or a finger duster to see who’s been snooping around! 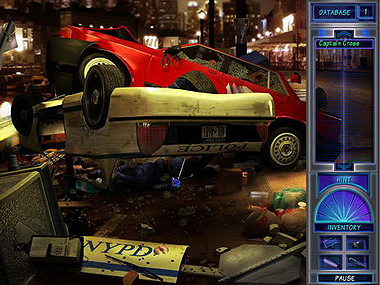 The mini-games throughout the game are unique and although rather simple, they provide a vital part of the storyline: one moment you are at a crime scene lifting a fingerprint and the next you are back at the crime lab running it through the database to find a match. Other mini-games have you assisting the crime lab in finding a match for the blood spatter you discovered in a spot-the-difference game! 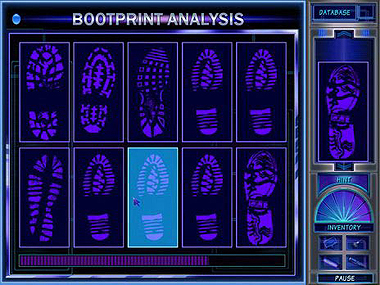 The game also has the usual tools like a Hint button and a map to place your progress in the game. Having said that, should you be clever enough to last a whole round without using up any hints, you could win one of the many “Achievements” which unlock slowly throughout the game. Bottom line – there’s really nothing like a hidden object game with a good storyline if hidden object games are your thing, and Masters of Mystery: Blood of Betrayal certainly delivers. Not only does the storyline flow smoothly between each hidden object scene, the story is gripping and really keeps you on your toes. This game will not disappoint, so clear you desk (and your morning/afternoon/evening) and start playing! Download and play Masters of Mystery: Blood of Betrayal now for FREE! i have downloaded games but can not bring them up at times i do but then lose them what am i doing wrong? the games are great and keep you occupied and on your toes all the time..it is very good 4me as i suffer from a really bad illness.so thanks to you all at free ride games. This was a very interesting game. Got a little lost because I thought the dad was a bad guy but he was just protecting his daughter. Overall I would give this game a 9 out of 10 score. I really enjoyed the game. I sometimes have a problem with the game just cutting off before time. Please tell me how to get the hidden object game started. I press the run know and it never downloads. What am i doing wrong? Can you help me Please I they would be great to do? Gottfried Leibniz is one of the greatest SOCRATICS bcuease he challanges everyday “common sense” notions of causality and of life. Significantly, Kant teaches us in the Introduction to his “Prolegomena to Any Future Metaphysics” that “common sense” is a meaningless answer to the puzzling arguments of David Hume. Rather, one must approach such puzzles in terms of “justified true belief theory.” The perspectives and conclusions of Leibniz constantly challenges the taken-for-granted justified true beliefs which prevent one from thinking creatively. Leibniz and Schopenhauer have the most unique metaphysical systems, in my opinion. According to David Dilworth in “Philosophy in World Perspective” (1989), [The four-by-four matrix composed by Dilworth has four hermeneutical variables in the horizontal plane. They correspond to Aristotle's Four Causes. In the vertical plane are the four "core" ancient Greek philosophical "profiles": the school of Aristotle, Plato, Democritus, and the Sophists.] Schopenhauer has the most unique concatenation of four hermeneutical variables in the history of philosophy. Dilworth describes Leibniz as an “atomistic Platonist,” or a “Platonic Democritean.” Leibniz somehow finds the elusive “middle terms” (sensus de communis) between these contradictory philosophical approaches! He thereby Socratically leads such everyday folk as myself to search for the wonders found in [...] Was this answer helpful?